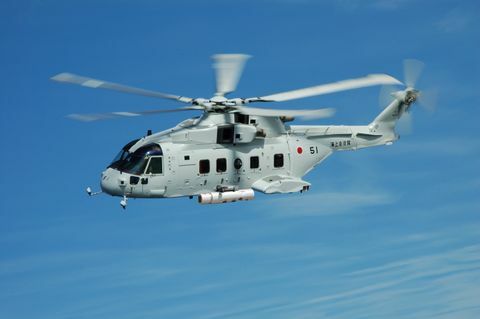 TOKYO and MELBOURNE, Fla. – Feb. 2, 2012 – The Japan Maritime Self-Defense Force has purchased four helicopter-mountable, laser mine detection systems to help protect its coastline and the daily maritime traffic coming in and out of the country's ports. This is the first direct commercial sale of Northrop Grumman Corporation's (NYSE:NOC) Airborne Laser Mine Detection System (ALMDS) to an international navy. "ALMDS will enable the Japan Maritime Self-Defense Force to cover significant distances at the speed of flight using its MCH-101 aircraft. This technology dramatically compresses the time between mine detection and neutralization," said Donna Carson-Jelley, ALMDS program manager for the U.S. Navy. "ALMDS keeps mine countermeasures ahead of the threats." The mine detection system is laser-based and utilizes streak tube imaging light detection and ranging (LIDAR) to detect, classify and localize near-surface moored sea mines. With high area coverage rate capability, the system transmits a fan-shaped beam of laser light to establish its swath width, and then relies on the forward motion of the helicopter to sweep the light over the water in a "push broom" manner. Four cameras are arranged to cover the same swath illuminated by the laser fan beam. As images are received by the system, an automatic target recognition algorithm picks out potential mine-like objects and stores their images for classification by shipboard Fleet operators, using computer-aided post-mission analysis tools. "The addition of ALMDS to the Japan Maritime Self-Defense Force mine countermeasures suite of solutions provides them with significantly enhanced mine detection capability—first developed for the United States Navy," said Pat McMahon, sector vice president and general manager, Military Aircraft Systems of Northrop Grumman Aerospace Systems. "The installation of this capability will also improve the exchange of information between the U.S. Navy and JMSDF during allied operations." Northrop Grumman is working closely with its industry partners Kawasaki Heavy Industries, Ltd., and Fujitsu Limited on the delivery and installation of ALMDS. "The addition of our mine countermeasures systems broadens the strong relationship we have with the Japan Ministry of Defense and we are very proud of that partnership. It goes back to the early 1960s," said McMahon. The Japan Air Self-Defense Force has flown the Northrop Grumman-built E-2C Hawkeye airborne early warning command and control system since 1982.